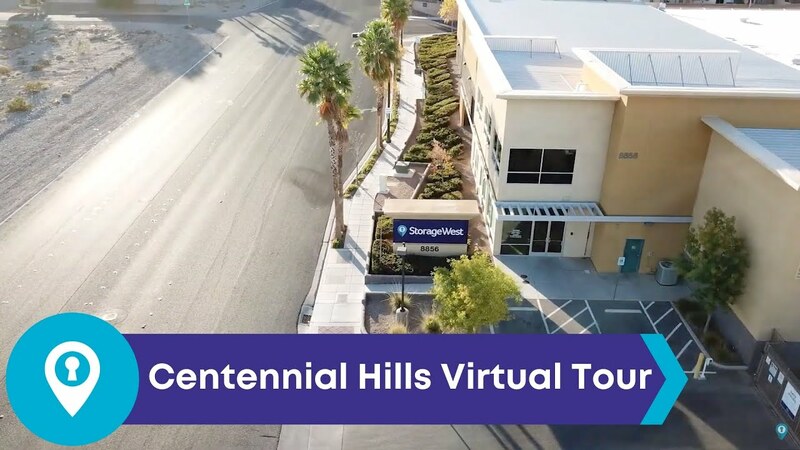 Storage West Centennial Hills is located in the northwest part of metropolitan Las Vegas. The property is on the corner of West Centennial Parkway and North Durango Drive and our address is 8856 West Centennial Parkway, Las Vegas NV 89149. This is Storage West's North West Las Vegas Self Storage location, click here to see other Las Vegas self storage locations. From the north, take either the 15 or 95 freeways south to the 215 west and exit on Durango Avenue. If you are coming from the south, take the 15 north to the 95 north then take the 215 west and exit on Durango Avenue. This is a mostly residential area including some shops and businesses. There is a combination of old and new developments. We are the closest Storage West facility to Creech Air Force Base and there are many military families in the neighborhood who use our facility. Our tenants like the fact that the property is clean, easy to access and has convenient access hours. We work hard to keep the property well maintained and looking good. We also pride ourselves on the fact it is very secure because of systems such as surveillance cameras, computerized entry and cylinder locks on our units. Anthony was awesome! Great help with my transition from Cali to Vegas. I really his laid back personality and approach to my situation. Very professional and reassuring. Clean, new, air conditioned environment withcadded insurance and security. Best experience, promise. Ask for him!! I have stored my good at this location many times since it opened. This time was as smooth a transaction as all of the others. Mike knows the business and the facility. He makes maximum effort to keep the clients happy. He would not let me move in to my new spaces as he advised me that it was not clean enough for his and the companies standards. Highly recommend this facility and their manager Mike.